Brilliant, beautiful, 21-year-old Katie Brandt, PhD candidate and woman of faith, detects a deadly conspiracy. 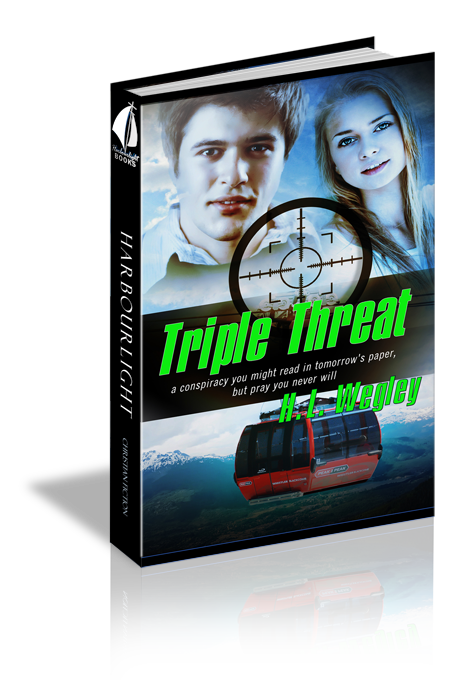 Suspecting it's only the tip of an iceberg, she dives in, pulling fellow grad student, Joshua West, with her into a high-risk investigation of a cyber-terrorist plot. Damaged as a child by the foster-care system, Katie takes huge risks to win acceptance and love. But when she risks the life of Josh, an agnostic who isn’t prepared to die, she fears her mistake might have eternal consequences. And that would break Katie's heart, a heart rapidly falling for Josh. If Katie and Josh survive the investigation, can they span the chasm of divergent worldviews that separates them? How can they awaken a dozing nation to a three-pronged danger that threatens its very existence? Triple Threat, a conspiracy you might read in tomorrow's paper...but pray you never will. As Katie Brandt read the printed email message in her hands, the words resurrected a horror from her graveyard of buried thoughts. Once again, she winced and writhed in the water as bullets from the AK-47 pounded her back. But as terrifying as that day five years ago had been, today could be worse. Much worse. In only a few more minutes, another shooter would open fire with an assault rifle. She read the next line of the message and drew a sharp breath. The printout slipped from her fingers and floated to the floor. The shooter was local…at Seattle Center. When she dropped to her knee on the computer lab floor to scoop up the paper, the reality of the situation brought an icy chill. Her mom and the twins were three miles away somewhere in the crowd at the big expo…at Seattle Center. No! She couldn’t allow the scene to play in her mind. A determination so fierce that it drowned her fear gripped Katie’s will. I’ve got to shut it down. Still kneeling, she pulled out her cell, hit her mom’s speed dial number, and waited. Come on, Jenn, answer. Mom...Jenn, she was still deciding what to call her adoptive mother of nearly five and a half years. Darn it! The call went to voice mail. Riding herd on a class of kindergarteners at the expo, no telling when Jenn would be able to check her messages. She grabbed the paper from the floor and looked up into the warm brown eyes of Joshua West, one of the other PhD candidates in the University of Washington’s Computer Science and Engineering Department. Josh was perfect. Katie had previously avoided his friendly overtures, but not today. “Josh, I need a ride, now.” She stood, her heart hammering out a driving rhythm. “Please, Josh. I need to get there in ten minutes or…” She couldn’t finish. Not only were Jenn and the twins at the big education expo, but there were thousands of other schoolchildren. She grabbed Josh’s hand and squeezed. “Pay for it? They won’t let you do my jail time.” He shook his head. “Josh, please.” She couldn’t help it. She was begging. “I will, when we get in your car. But my guess is the help will arrive too late.” Or too loudly. “This guy’s a terrorist. I used my research tools and a little hacking to find him. I just realized what he’s up to.” She climbed into the car. Josh slid in on the other side. The look on his face appeared to question her sanity. But, thankfully, he hit the ignition. Katie had avoided his question about the police response. Her answer would be inadequate, but she couldn’t say that to a guy who already thought she was crazy. He shoved the car into reverse and squealed out of the parking space, throwing her forward in her seat. When he shifted to drive and hit the gas, Katie’s head slapped the headrest as she fished for her cell in her shorts pocket. “I’m calling 911 now. I don’t know if they’ll believe me or not, so get me to the west entrance to the Key as fast as you can. My mom and my little brother and sister are there, and the guy’s supposed to start shooting at 2:30. That’s just a few minutes from now.” She keyed in 911. “They—” She stopped. If she gave him too much information, he’d probably back out of the whole deal. Josh’s car had a lot of power. In only a few seconds he had run red lights at two intersections and was now accelerating onto 520, racing toward I-5. The call center operator answered with the standard what’s-your-emergency greeting. She looked over at him. “They’re trying. Transferring me to the FBI. Their office isn’t far from the Center. I know some of the agents there, so maybe—Blast it! They cut me off. They’re never supposed to—” She drew a sharp breath and reached for the handle above the door as they flew into a turn. The tires squealed as Josh’s car slid through a curve at the end of the off ramp. Katie gasped when he ran a red light on Mercer. She tried to take a calming breath. It didn’t help. She let go of the handle and redialed. “It’s her,” the operator said to someone else. There was a lot of noise in the background. Evidently, she had stirred things up at the call center. Josh swerved from one lane to another, dodging cars, flinging Katie side to side. Her shoulder slammed into the door as he veered left onto Broad Street. “There’s a shooter at the Key and you’re headed there? Back off, Katie. You were lucky the last time—” Peterson stopped. She could hear noises on Peterson’s end. He was probably trying to direct other agents even before he finished talking with her. “I don’t think you can.” Her words hadn’t come out the way she intended. “What? Who do you think you are?” A loud expletive blasted in her ear as Josh steered the car around the sharp corner from Denny Way onto 1st Avenue. “You shouldn’t have said that, Kate.” The car wheels squealed a final complaint as Josh braked to a stop outside the west entrance to Key Arena. “I’m going to stop this guy, Peterson. Get here as quickly as you can. We don’t have any more time—” she decided to hang up on Peterson before he found a worse word in his meager cursing vocabulary. Peterson’s furious voice blasted out through her cell. Too late, and she had accidentally bumped the speaker phone button. “Sounds like you’re in trouble with the FBI.” Josh stared at her. She didn’t have time for explanations. When the car jerked to a stop, Katie flung the door open. Especially her? She didn’t have time to dwell on hidden meanings. Maybe later. If there was a later for her. Maybe Josh was right and this was crazy. No. She couldn’t let some deluded jihadist shoot little Grady and Grace…and Jenn. Tears filled her eyes. Katie stopped at the foot of the huge arch and wiped them away, hoping Josh hadn’t noticed her weakness. He ran up beside her and stopped, hands on hips, staring up at the edge of the monstrous convex roof. “So Kate Brandt is a ninja babe?” Reluctance remained in his eyes, and his hands remained on his hips. Darn! A tear spilled from her eye. She hated to cry, to appear weak. Josh’s hands came off his hips and reached for her. His reluctance had melted. Katie looked at his athletic build and strong arms. “Please, Josh. If not for me, then do it for my little brother and sister, for my mom, and for all the other kids out there.” More tears trickled down her cheeks. Maybe tears were good for something. Josh’s powerful legs drove his body up the arch, stopping beside her. This was not a ladylike thing to do with a guy, but that wasn’t a concern at this point. Only three minutes until the gunman would start shooting…if his watch wasn’t fast. She moved in front of Josh, facing him, their eyes only inches apart. “Never,” she said, shaking her head. “Not the likes of him.” She stepped up on his knee. Josh felt as solid as a rock. She pushed upward and swung a leg around his shoulders. “Then go ahead. I won’t drop you.” Somewhere Josh had found confidence. Using the stirrup, Katie stood on his shoulders, holding Josh’s hands and teetering to gain her balance. She let go with one hand and placed it on the roof. Then the other hand. But the roof was still chest high. She couldn’t climb onto it. “Yeah, because…” Josh growled at her. Josh drew a breath. “One, two, three.” He bent his knees and jumped. She pushed off his shoulders, propelling her body three feet up into the air. Katie landed spread-eagled on the steep slope at the roof’s edge and clung there, praying she wouldn’t slide backward. Below her she heard a thud, then the raspy sound of sliding. She looked down. Josh had landed spread-eagled on his back, head downhill on the big arch. He had jumped too hard, but managed to stay on the arch and had stopped his slide. Was he OK? She gave him thumbs up. He returned it and was punished for his effort by sliding another foot head-first down the concrete and steel arch. In one quick movement, he swiveled his feet below his head and rolled onto his stomach. He looked up and waved her on. Katie turned and breathed a quiet prayer as she crept up the roof toward the communications facility. On the far side of the structure, somewhere amid the antennas and dishes, a movement caught her eye.